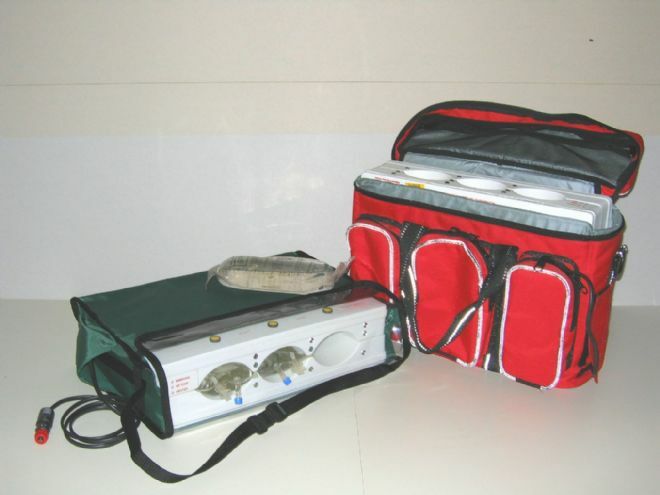 Portable 12v IV fluid warmer for Paramedics, Doctors and ambulances, including air ambulance. Accommodates three 1 litre fluid bags or up to six 500ml bags. Comes complete with carrying case and shoulder strap. Insulation ensures that even once disconnected from the power source, the bags will remain warm for up to 2 hours at the scene of the accident, ensuring the patient receives warm fluids until transport to hospital is possible. A 240v power supply unit is available to enable the unit to be kept warm and ready for use at a base station.